In a Vase on Monday: Pop! The tulip season will be drawing to an end soon, so I just had to make the most of them again for a vase this week, as I join Cathy at Rambling in the Garden for her Monday meme. The white one at the back is ‘Green Star’ which stands out well in the rockery near the fringed white one I featured a couple of weeks ago (‘Swan Wings’). On the left is the raspberry ripple style parrot tulip ‘Estella rijnveld’ and in front of that a yellow lily shaped one which I have now correctly identified as ‘Flashback’ after looking through orders and receipts. The peachy double one at the front is ‘Charming Lady’ and the parrot tulips in the middle are the orange ‘Irene Parrot’ and the red ‘Rococo’, both from Peter Nyssen – Irene was in their Harlequin collection. On the right, probably my favourite of all, is ‘Eye Catcher’, which I have had for years now. On the right of that is the lovely pink ‘Attila’ (also from the Harlequin collection). The single lemon yellow tulip on the right remains unidentified for now, and finally front centre is an unnamed fringed red tulip, which I am going to call ‘Frank’… 😉 If I could send bulbs to the US I would dig them up and send them to Frank at Sorta Like Suburbia to try and convince him how lovely the fringed ones are and how any discerning tulip collector simply has to have at least one! The fillers are Kerria japonica, Aruncus foliage and Brunnera. Did you spot the little snail I found on the Kerria? Here he is again below… Cute! What a splash of color. Love it. I don’t love so much your little hitchhiker. I don’t mind the snails at this size, although I expect he will grow rapidly! Love how the Brunnera electrifies the tulip colors. Thanks Marian. The Brunnera is the perfect filler! Another delightful and colorful vase. Thanks again for sharing your garden with us. Thank you John. My pleasure! The snail adds extra beauty, unlike the earwig that wiggled out of some of my cut flowers. I will not switch to bought flowers, which may be sprayed or, heaven forbid, dyed. I’ll just keep inspecting for little critters. Lovely!!!! Oh, I don’t like earwigs at all! One of my least favourite bugs. When the peonies flower and I can cut some, I will have ants indoors no doubt! I dip my peonies in a big bowl of water after I cut them and shake off the ants. The singles don’t do well with this, because it spreads pollen on the petals. The doubles do fine. I can’t believe how many insects end up floating in the bowl. I always shake mine too, but still manage to get the odd stray ant on the table! I’ll have to try dunking them in water too. Thanks for the tip! 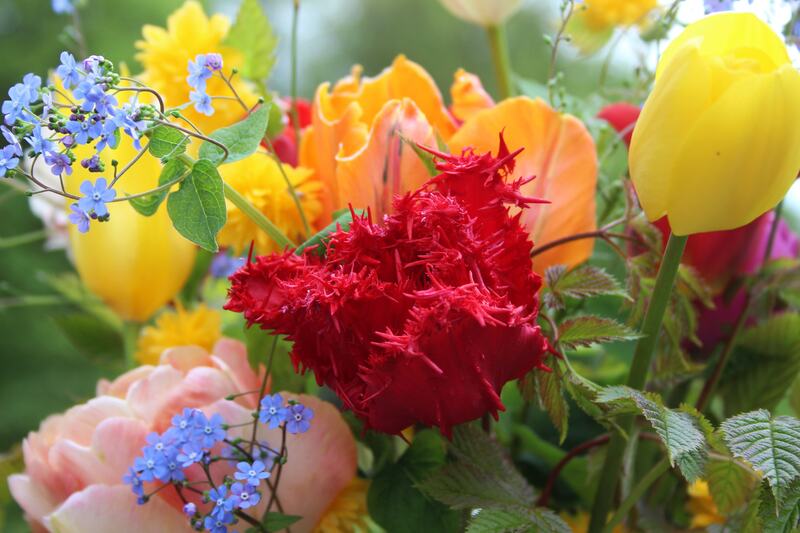 I love the elegance of a simple tulip, but the frothy parrots and fringed ones are just irresistible! I love the bright colors…like a pop of Spring. These colours are really brightening up my windowsill on a grey day today! I love your taste in tulips, Cathy – I like the fringed, wavy, semi-doubles, all lush beauty. I have to figure out a way to outsmart our voles! A raised bed is a good idea. Some fashion wire cages buried in the soil, which the shoot grows through. I might have luck next to the foundation of the house, as the voles seem to be mostly in the fields/gardens away from the house. Great to have so many varieties to display. I especially am drawn to the peachy double and the orange parrot. Seeing your lovely brunnera makes me realize mine is missing this spring. Will have to check on that. Enjoy your beautiful tulips as long as you can. Happy week. I saw that peachy one (Charming Lady) on Julie’s blog (Peonies and Posies) last year and fell for it! It is definitely the most fragile of all of them, not standing up to the rain we have had so well, but it is so pretty! What a stunning vase to begin the week! Oh snails! On foggy mornings I often gather them up to reduce their impact on the garden…. I gave up years ago Deb, the snails eat the slug lava, so they get to stay and I have only half the damage! LOL! Gorgeous, zingy colours – a really lovely collection, Cathy. The forget-me-nots add even more loveliness! Just beautiful. Had to look up Brunnera to see if it was the lovely blue flower. Saw it is also called forget me not. I’m first time growing Chinese forget me not (cynoglossum) for that blue airy look. So colourful! Verey special tulips and cute snail! Again, we expect frost this night. Hi Uta. It isstill cloudy and grey here, so mild again tonight, but for tomorrow night we have been warned to protect any delicate plants! Your explosion of bright tulips is wonderful. The blue forget-me-nots balance those hot colors nicely. Destructive as they can be, the tiny snail is awfully cute – if only they (and their appetites) didn’t grow so quickly! I suppose a tiny snail like that can’t do too much damage! or can it? Your bright vase showcases your tulips beautifully. A wonderful mix of colours and shapes. Beautiful, a wonderful selection Cathy. I love the fringed ones and have them in a variety of colours. Love the tulip collection and the double Kerrias, the snail is a bonus – hopefully leaving no holes. What gorgeous, vibrant colors, Cathy. Great photos, too. And look at that wee snail! I hope you’re having a good week. Wow, still down to freezing. I guess when you are that far north, you get more of the temperature swings. It’s like that in the desert too. We’re expecting two very hot days, then unseasonably cool days this weekend. The weather is all over the map. Hi Debra. The later tulips really keep the garden colourful until the first summer flowers open, so I am so grateful for them! What luscious tulips Cathy! The rain wiped out the very last of mine (Ballerina) at the weekend. But they have gone on for weeks and weeks this year. I particularly liked your ‘Charming Lady’ – now on the list. It does look like a Julie flower doesn’t it?!!! So thanks to her as well. ‘Frank’ is super too – and I hope you convert him! Since I’m such an inconsistent blogger, didn’t realise he had something against the fancy tulips and interesting that they are the ones we tend to like least. As for the sweet snail – I’d almost forgive them anything with a dear little picture like that! Many of mine have now lost their petals too, but all the foliage helps keep the garden looking green before other flowers fill in. I think the snails are so cute when tiny, and we do get some with pretty shells too, but the bigger ones have already started nibbling at some seedlings in pots (now out of reach!) and I fear I will not see my Echinacea flowers again this year as the fresh leaves get eaten as soon as they appear! Cathy a bouquet of colorful tulips and beautiful. It gives joy so much color and so many different tulips and very bonitos all. Mr. Caracol is great in the industry always be so small and not grow more. Greetings from Margarita. Caracol must be ‘snail’ in English! Yes, I hope he is a dwarf! 😉 Have a good week Margarita! Your arrangements certainly do pop! Even the snail looks brightly colored. 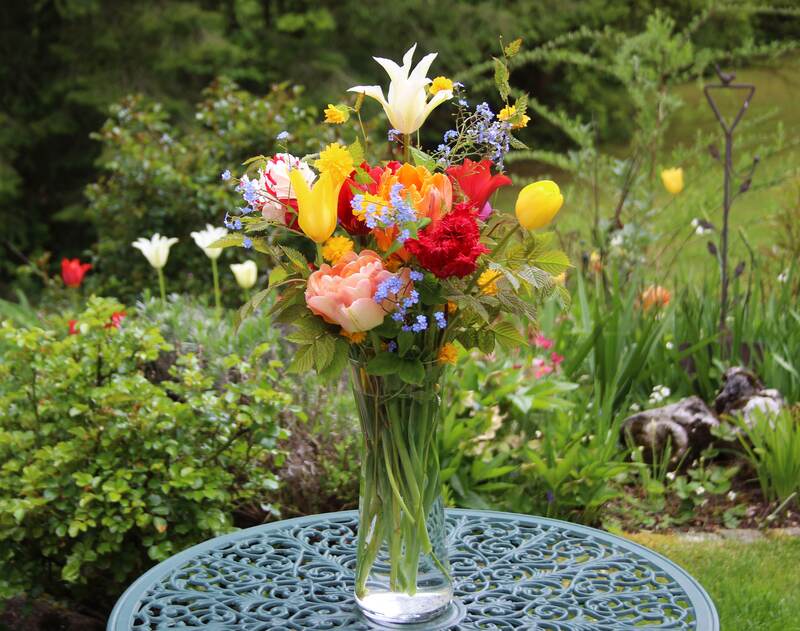 A most colourful and eye-catching vase of tulips Cathy. I haven’t grown any of them apart from ‘Charming Lady’ which is new to me this year and which more than lives up to her name. I’m not so sure about the passenger on the kerria. If only they were as innocent as they look. Thanks Anna. The snails are out in force tonight after a warm day ending with rain… I shall inspect the damage tomorrow morning!